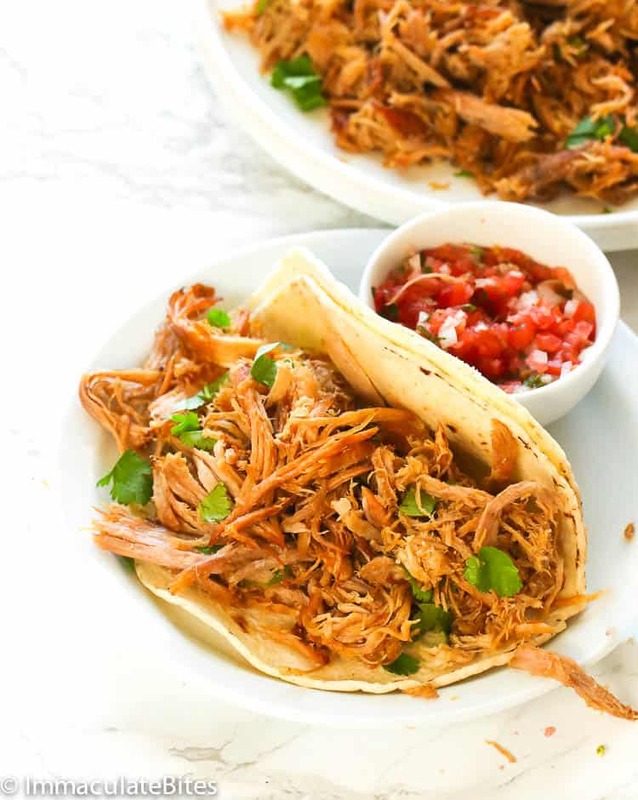 Slow Cooker Carnitas – juicy and highly-seasoned pork slow cooked until tender enough to pull apart with forks then broiled slightly for crisp delicious edges. The most delicious, easiest and healthiest version of carnitas! Great filling for tacos, burritos or in bowls. Roasted pork is one of my preferred meaty dish to make. It has a lot of upsides: easy to make, crowd-pleaser, plenty of leftovers and is great for entertaining (makes an excellent center piece). Can you guess what the best part is? I don’t have to slave in the kitchen all day. An added bonus is that you can incorporate various spices pantry ingredients and, of course, lots of onion and garlic goodness to make this pork very tasty. Very tasty could even be an understatement! Carnitas are one of the best dishes usually served during Cinco de Mayo parties (a Mexican celebration). But through the years of eating and preparing this, I can always attest that this pork dish here is a always a crowd-pleaser year round. 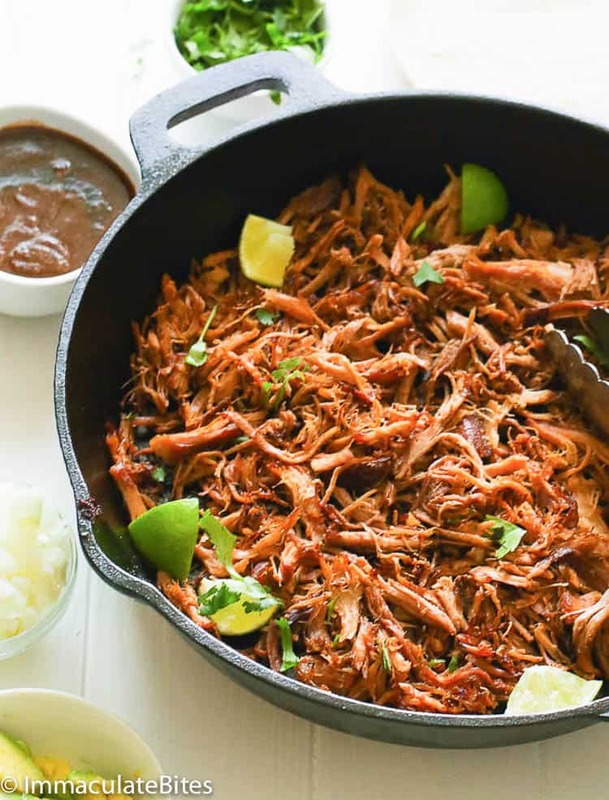 If you happen to know or have eaten pulled pork, Carnitas is the Mexican equivalent to it. 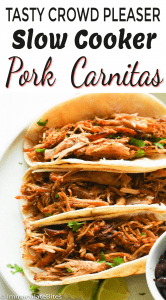 Carnitas which literally means “little meats” are made by braising or simmering pork traditionally with lard in a very low heat for hours until tender. After achieving that desired tenderness, the heat is cranked up until the outside portion of the pork starts to crisp. It is then pulled apart by hand or fork and use as fillings to tacos, tamales, burritos and whole lot of other exquisite Mexican dishes. 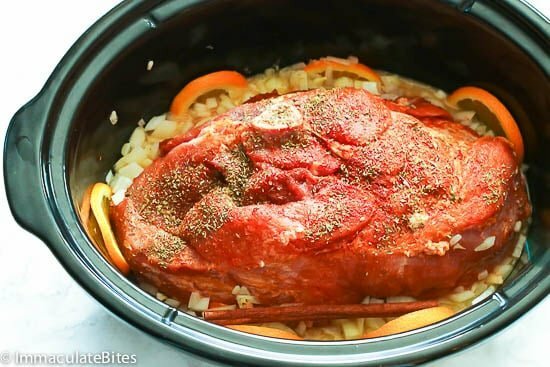 How to Make Slow Cooker Carnitas? Fortunately, modern technology has basically allowed us to experience carnitas in an easier and healthier way. This recipe somehow uses natural ingredients without the fattening content from lard or oil. And even without lard, this slow cooked carnitas here yields a flavorful meat that you would be proud of. I started off by rinsing the pork under cold water and removing the pork skin or any visible fat. Then it gets easier after that. 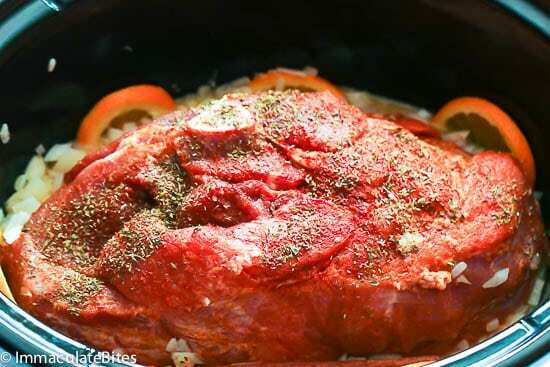 Just throw in garlic, bay leaf, chili and the orange juice in the slow cooker, then rubbing the pork with salt, cumin smoked paprika and oregano before adding it as well into the slow cooker. Once you rub the dry spices onto the pork, you don’t need to sear the pork. You still will be rewarded with a nice crispy brownish exterior- my favorite part. Notice that I use orange juice in this recipe along with Mexican Canela (Mexican cinnamon) which is the softer loose-bark variety of cinnamon stick that we commonly find at the grocery stores. You can buy them in Mexican maret or specialty stores or online through amazon.com. Regular cinnamon stick or ground cinnamon works fine as a substitute for this ingredient. The natural sugars from the orange juice tenderizes the meat while giving a mouthwatering taste and a mesmerizing aroma from the cinnamon and bay leaf in every bite. 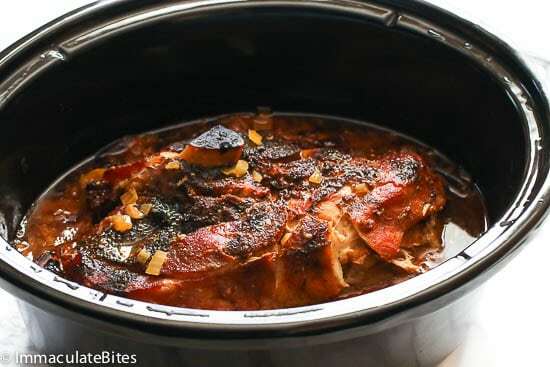 Once you have everything added into the slow cooker, you can now leave it to to cook for 8 hours, do your other stuff or come home from work to a heavenly smelling house and a lip-smacking dinner. You may serve it that way or broil the shredded pork for 10-15 minutes for that crisp and golden brown edges which I truly LOVE! While I do enjoy Slow Cooked Carnitas straight off the slow cooker (Oh yes I do! ), I also love serving them with Mexican Rice. For parties or feeding a crowd, you can use them as fillings for tacos, burritos, enchiladas, quesadillas, sandwiches or even in salads. The possibilities are endless! You may switch the orange juice with pineapple juice for a slightly sweet taste. If you like spicy pork, throw in a whole scotch bonnet for a spicy and sweet pork then pop it in the oven until it’s cooked through. 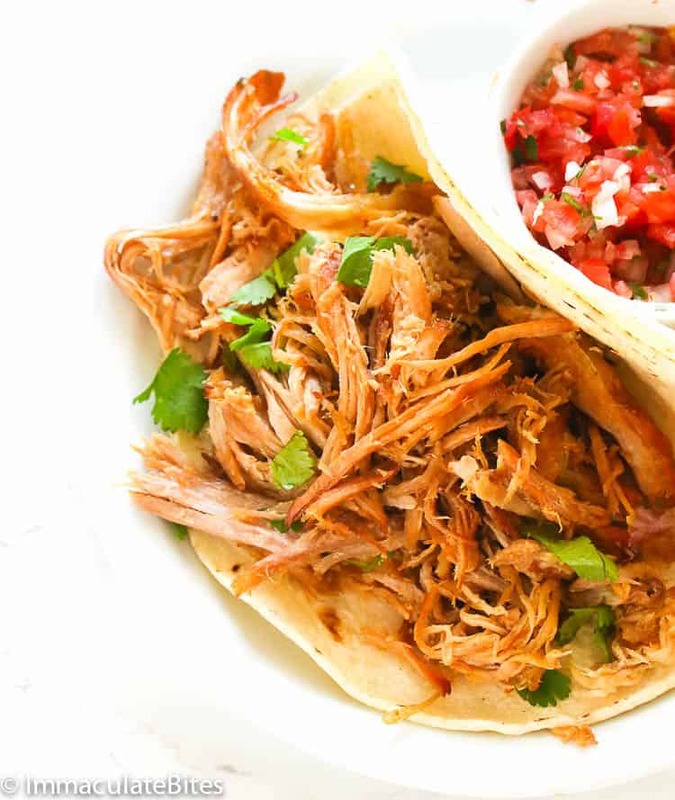 Slow and low is what makes this Slow Cooked Carnitas simply the BEST! Mexican Canela (Mexican cinnamon) is the softer loose-bark variety of cinnamon stick that we commonly find at the grocery stores. You can buy them in Mexican market or specialty stores or online through amazon.com. Regular cinnamon stick or ground cinnamon works fine as a substitute for this ingredient. For a slightly sweeter taste, you may switch the orange juice with pineapple juice. If you like spicy pork, throw in a whole scotch bonnet for a spicy and sweet pork. If you want to serve it later, shred the pork but don’t broil it. Store the pork and juice separately in the refrigerator for up to 3 days or freeze for up to 3 months. This post was first published on February 2014 and has been updated with new photos, content and a recipe update. 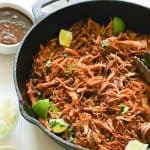 Slow Cooker Carnitas - juicy and highly-seasoned pork slow cooked until tender enough to pull apart with forks then broiled slightly for crisp delicious edges. 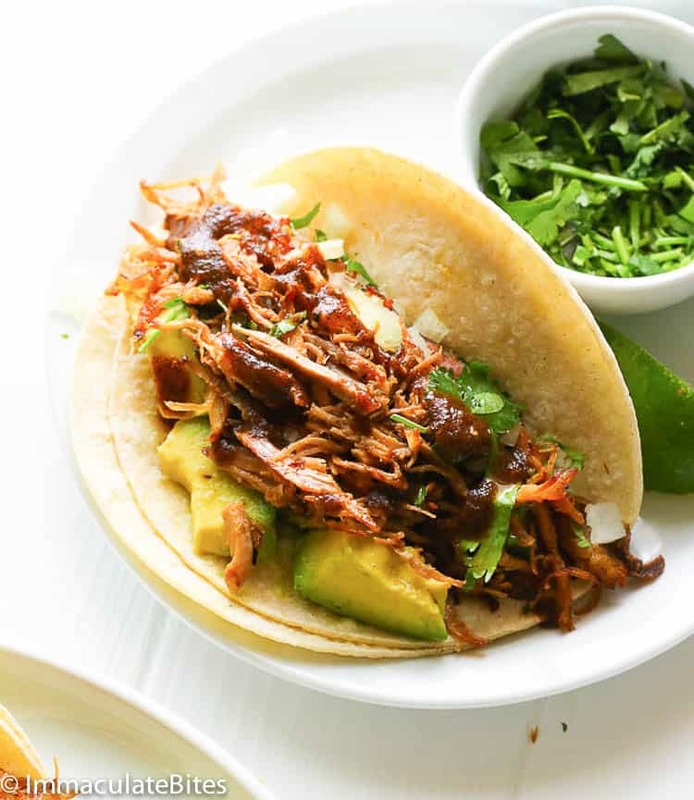 The most delicious, easiest and healthiest version of carnitas! Great filling for tacos, burritos or in bowls. Remove pork from packaging and gently rinse pork under cold water. Remove pork skin and any visible fat. Add half of the minced garlic, bay leaf , chili and the orange juice to the slow cooker. Season pork with salt, cumin, smoked paprika and oregano. Place in the slow cooker. Add the remaining crushed oregano leaves, cinnamon stick and onions in the slow cooker. Cover and cook on Low for about 8 hours or until the pork shreds easily with a fork. Remove the pork roast from the slow cooker and shred. Reserve cooking liquid. The meat should be tender enough to pull apart with forks. Place the shredded pork on a foil on a baking sheet. Use liquid from the pork to moisten carnitas. Broil on high for 10-15 minutes, stirring once, or until the edges of the pork begin to crisp and brown. Keep a close eye to avoid burning. Use tongs or spatulas to turn as needed . Serve warm as a filling for tacos, burritos or in bowls. If you want to serve it later, shred the pork but don't broil it. Store the pork and juice separately in the refrigerator for up to 3 days or freeze for up to 3 months. Remove pork from packaging and gently rinse pork under cold water. Remove pork skin and any visible fat. Add half of the minced garlic, bay leaf , chili and the orange juice to the slow cooker. Season pork with salt, cumin, smoked paprika and oregano. Place in the slow cooker. Add the remaining crushed oregano leaves, cinnamon stick and onions in the slow cooker. Cover and cook on Low for about 8 hours or until the pork shreds easily with a fork. Remove the pork roast from the slow cooker and shred. Reserve cooking liquid. The meat should be tender enough to pull apart with forks. 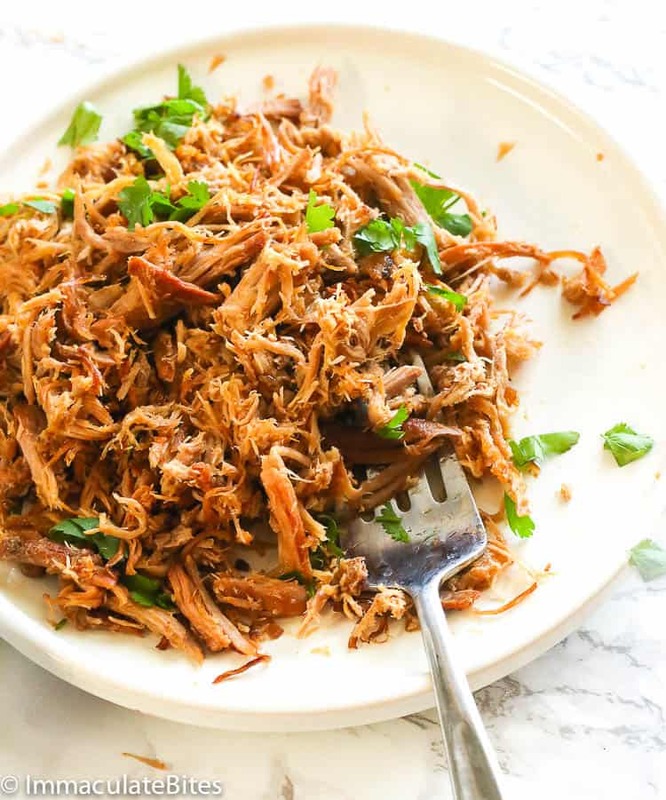 Place the shredded pork on a foil on a baking sheet. Use liquid from the pork to moisten carnitas. Broil on high for 10-15 minutes, stirring once, or until the edges of the pork begin to crisp and brown. Keep a close eye to avoid burning. Use tongs or spatulas to turn as needed. Serve warm as a filling for tacos, burritos or in bowls. this looks wonderful! I’m going to try it for a dinner party next week…. ! Thank you. I think I’ll serve it with couscous and a salad. Your recipes are wonderful! Am sure your guests are going to love it . I don’t have a slow cooker. How long would it take to cook it on the stovetop ? Could I cook it in the oven? Could you substitute chicken or beef for the pork? Yes you can. The cooking times might vary. Is the juice from 2 oranges enough fluid for the pork to cook in or will additional water be needed. Hi Leroy! Yes, it’s for the pork to be cooked in. No additional water will be needed.